LONDON — Hunter Kemper looks the part of a veteran triathlete. His face is creased from squinting in the sun. His legs are lumpier than mom's mashed potatoes. The London Games were his fourth Olympics. He wasn't sure if they'd be his last. "Being 36 years old, the leg speed isn't quite there," he said, after placing 14th overall in the men's triathlon final at Hyde Park on Tuesday. "Sure as heck wasn't there today. I wish it was. I'm a lot better runner than that." Kemper's time of 1:48.46 was over two minutes off the brisk pace of Great Britain's Alistair Brownlee, who won gold in 1:46.25. USA runner Manuel Huerta was a disappointing 51st overall at 1:53:39. "Wasn't happy with the result, that's for sure. My overall place, I wasn't happy with," said Kemper. "We knew it was going to come down to a run, and it did, and it was superfast." 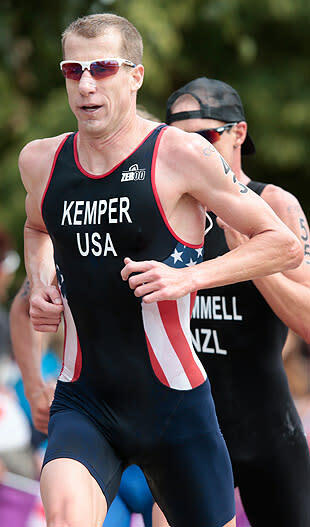 The question now for Kemper: Can he keep up with a rapidly changing sport? Kemper was happy with his swim in The Serpentine, which had him 21st in 17:25 after the 1.5km course. His cycling time was 58:44 over 43km, as the competitors snaked around the park, venues such as Buckingham Palace, and the U.K. flags held by fans around the course. "I was just assuming they were cheering for me," joked Kemper. But it was at the second transition, bike to running, where he said his race went awry, as he suddenly found himself in the back of the pack he was racing in. "I just didn't position myself right," he said. That led to a run in which Kemper never felt in-rhythm on the choppy course that featured quick turns. "I need a full 10K to get into it," he said. "But apparently, I didn't need 10K today. I needed 40K." Kemper and Simon Whitfield of Canada were the only four-time Olympians in the triathlon, and neither was happy about his race. Whitfield, 37, crashed during the cycling stage of the race, totaling his bike, and was unable to finish. "I'm not quite sure what happened. I hit the speed bump on a funny angle and ended up crowd surfing, which is good for concerts and not so good for sport event," he told the Canadian Press. "My bike went out from underneath me. I have some pretty serious gashes: My big toe is stitched up, both knees have seen better days, my shins have seen better days. I've got a good goose egg on my head." His daughter, Pippa, gave her father a bouquet of maple leafs she had picked to cheer him up after the crash. Whitfield has said these are his last Olympics. Kemper isn't sure. He knows his chances for a medal have likely faded into history, but his usefulness as a teammate is still paramount for the U.S. The Olympic triathlon is an individual sport that's being run as a team event. Each nation with multiple entrants uses them to control the tempo or affect rival runners. In this regard, it's become a bit like cycling. "Maybe I can be that tactician that other teams are starting to go towards," he said. "We have a lot of young athletes. Maybe I get that medal for the USA, but not for me individually." He'll be 40 when the 2012 Rio Games are held. Being in the four-time club is special; but coming back for another one? "Maybe I'll be in the five-time club, and it'll be real special," said Kemper. "They'll wheel me out in a wheelchair out there in Rio."